A typical process for a mold or a die usually requires several machining technologies, primarily the drilling and profiling processes that we will make with modern CNC machines. When the generation and the manual program introduction directly written in the CNC is controlled, the urgent necessity of reducing the time generation of these programs and the introduction of such in the CNC memory prevails. In addition, this process has to be fast and easy so as to be able to be in the hyper competitive market nowadays and, if possible, to allow us to prepare our work days ahead and have the possibility of modifying the programs just before execution. Fikus for Milling Machines has been designed specifically to produce programs, of 2 and 2,5 dimensions, easily and quickly. 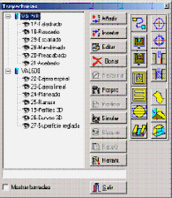 The product is a Windows 32-bit native application, with dynamic OpenGL rendered graphics, and user interface with clear and concise icons and toolboxes, making the learning process easy. All the common processes are available and implemented with optimized technological tables. The Fikus ToolPath Manager allows for easy creation of milling procedures. This procedure is a combination of geometric and technological data presented in a logical tree, easy to create and edit at any stage in the process. The set of procedures may be saved as a template and applied to other geometries at a later stage. Using this feature, a machining process may be saved and reused. Manipulation of geometries and procedures in the Path Manager (i.e., create, edit, move, copy or delete) are possible using standard Windows features - copy, cut, paste, drag and drop. Fikus is a complete solution for 2.5D parts milling through a milling center. The contouring and roughing options in 2 dimensions with multiple contours and islands, and the canned cycles compose the basic system. In 2.5 dimensions, Fikus allows the construction of 3 dimension figures with the help of cycles easy to use and understand, without constructing surfaces, while working with 2D geometries, much more simple to design and to modify. Fikus mills complex parts on a 4th axis, which if made on 3D systems would represent a really complex task, and can make the stamping rollers or cutting tools (mill tools) easily and quickly. During the creation of the part, Fikus allows the user to visualize it as a solid rendered object and dynamically pan, zoom or rotate it using the OpenGL standard graphics incorporated. The changes made (by changing height, tool position, milling direction, 2.5D figures, projections, contour synchronization, etc.) are automatically shown on the screen. During the toolpath simulation, Fikus can also show the parts as solid rendered objects and zoom, pan or rotate the scene. As an application designed specifically as a solution for the programming of machining centers, Fikus helps the user to make the most complex programs easily and quickly. The process tables and postprocessors tailored for each machine help us to obtain an optimized CNC program made on known environments. Fikus automatically detects technological situations like core or cavity, opened or closed parts, reducing the number of user inputs. The user need only select the roughing or finishing phases and Fikus sets the necessary parameters automatically and creates the appropriate paths. The selection of the contours is made automatically " by window " and Fikus detects open and closed islands and contours. The different options implemented in the canned cycles allow us to make types of cycles that are not implemented in the CNC machine, but which turn out basic according to the type of part or material to machine. 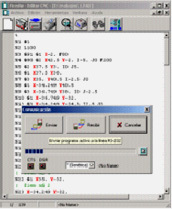 Fikus incorporates a powerful CNC editor with the most common edition functions, together with functions developed specifically for the edition of CNC programs. It can also send or receive the programs directly to the different machines connected to the computer, using the different protocols and communication speeds. Fikus is a robust, flexible and easy-to-use application designed to reduce overall programming time and ultimately, improve the machining capabilities of the milling machines.